After 18 Years ! As professional recyclers we have recycled most makes of Inkjets ! will need to be soaked overnight. With MORE THAN 100 FULL COLOR photos. To help YOU if needed. 30mls (Concentrate) = Extra strength.IDEAL FOR clearing MORE DIFFICULT CLOGS ! SPECIAL ANYWHERE (WORLDWIDE) BY PRIORITY AIRMAIL. SPECIAL OFFER!!! Buy 3 & Get 1 EXTRA FREE !!! 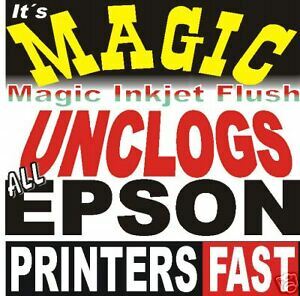 Includes FREE Dr.EpSUN Refill Tool = Compatible to Refill ANY Epson Inkjet plus Color Copyright Instructions!